The Supreme Court on Monday delivered a detailed judgment in the Hadiya case, almost a month after it set aside the Kerala High Court judgment calling Hadiya's marriage to Shafin Jahan a “sham”, and annulling it, while directing her return to the protective custody of her Hindu parents. In the judgment, the Bench comprising Chief Justice of India Dipak Misra, Justice A.M. Khanwilkar and Justice D.Y. Chandrachud opined that the High Court had transgressed the limits of its jurisdiction, and therefore set aside the impugned judgment. It, however, allowed investigation by the NIA to examine any aspects of criminality involved, while clarifying that the validity of marriage between the two would not be a part of the subject matter of investigation. Chief Justice Misra authored the majority opinion on behalf of Justice Khanwilkar and himself, while Justice Chandrachud wrote a separate concurring opinion. The Court was hearing a Special Leave Petition filed by Mr. Jahan, challenging the judgment passed by the Kerala High Court. In the impugned judgment, the High Court Bench comprising Justice Surendra Mohan and Justice Abraham Mathew had made some controversial observations like: “a girl aged 24 years is weak and vulnerable, capable of being exploited in many ways” and “her marriage being the most important decision in her life, can also be taken only with the active involvement of her parents”. Mr. Jahan had now contended that the marriage was annulled without any legal basis, and had submitted, “…the impugned order is an insult to the independence of women of India as it completely takes away their right to think for themselves and brands them as persons who are weak and unable to think and make decisions for themselves. That the same is against their fundamental rights and should be struck down”. A Bench comprising Chief Justice J.S. Khehar and Justice D.Y. Chandrachud had thereafter directed the National Investigation Agency (NIA) and the Kerala Government to submit all documents related to the case. It had also directed Hadiya’s father Asokan to submit proof of his claim that Hadiya was converted after being radicalized. Soon after, the Apex Court had directed an NIA probe into the case, under the supervision of former Supreme Court Judge, Justice R.V. Raveendran. 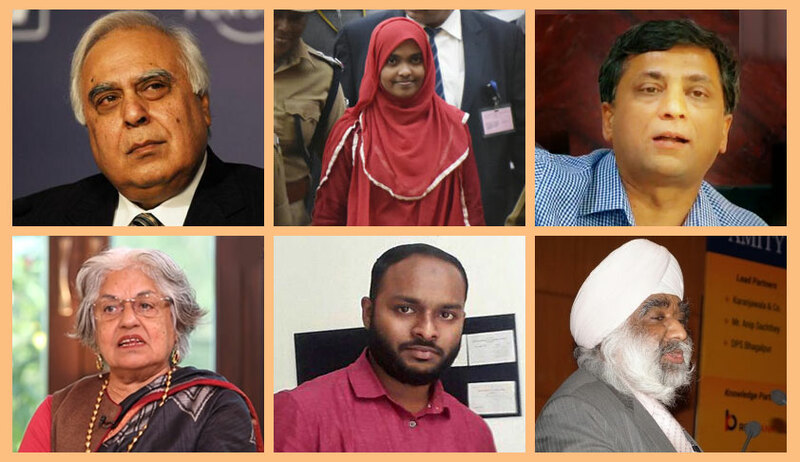 Justice Raveendran had, however, declined the Court's request, after which, Hadiya’s husband had approached the Apex Court, seeking recall of the order directing NIA probe into the matter. He had filed an application contending that “certain facts have emerged which call for a reconsideration” of the order. He had further submitted that the Agency had begun investigating the matter despite Justice Raveendran's refusal to head the probe. This, he had said, violated the Court's order. There have been several allegations and counter-allegations since. In November, when the Court finally heard Hadiya, it directed her to be sent “at the earliest” to Sivaraj Homeo Medical College, Salem to complete her house surgency. The Kerala Government was asked to make all arrangements and the Dean of the college was directed to ensure her protection. Hadiya had then, earlier this year, sought the Court's permission to live with Shafin Jahan as husband and wife. In her affidavit, Hadiya had categorically stated that she had embraced Islam and married Shafin Jahan on her own free will. In his opinion, Chief Justice Misra began with analyzing the role of the Court when faced with a habeas corpus petition and opined that in the case at hand, the High Court had been "erroneously guided by some kind of social phenomenon that was frescoed before it". "The High Court further erred by reflecting upon social radicalization and other aspects. In a writ of Habeas Corpus, it was absolutely unnecessary. If there was any criminality in any sphere it was for law enforcement agency to do the needful but as long as the detenu has not been booked under law, the obligation of the court is to exercise the celebrated writ that breathes life into our Constitutional guarantee of freedom." The Court went on to rap the High Court for invoking the Parens Patriae doctrine, asserting that the same can be exercised only in exceptional cases where the parties before it are either mentally incompetent or have not come of age and it is proved to the satisfaction of the court that the said parties have either no parent/ legal guardian or have an abusive or negligent parent/ legal guardian. It then emphasized on the freedom of choice being a constitutional as well as a human right and set aside the impugned judgment, observing, "In the case at hand, the father in his own stand and perception may feel that there has been enormous transgression of his right to protect the interest of his daughter but his view point or position cannot be allowed to curtail the fundamental rights of his daughter who, out of her own volition, married the appellant. Therefore, the High Court has completely erred by taking upon itself the burden of annulling the marriage between the appellant and the respondent no. 9 when both stood embedded to their vow of matrimony." The Bench also held that non¬acceptance of her choice would simply mean creating discomfort to the constitutional right by a Constitutional Court which is meant to be the protector of fundamental rights. Such a situation cannot remotely be conceived. “The duty of the Court is to uphold the right and not to abridge the sphere of the right unless there is a valid authority of law. Sans lawful sanction, the centripodal value of liberty should allow an individual to write his/her script. The individual signature is the insignia of the concept”. In a separate concurring opinion, Justice Chandrachud expressed his anguish with the "grievous miscarriage of justice" which took place in the case at hand. "The schism between Hadiya and her father may be unfortunate. But it was no part of the jurisdiction of the High Court to decide what it considered to be a ‘just’ way of life or ‘correct’ course of living for Hadiya. She has absolute autonomy over her person. Hadiya appeared before the High Court and stated that she was not under illegal confinement. There was no warrant for the High Court to proceed further in the exercise of its jurisdiction under Article 226." "In deciding whether Shafin Jahan is a fit person for Hadiya to marry, the High Court has entered into prohibited terrain. Our choices are respected because they are ours. Social approval for intimate personal decisions is not the basis for recognizing them. Indeed, the Constitution protects personal liberty from disapproving audiences." ... The strength of our Constitution lies in its acceptance of the plurality and diversity of our culture. Intimacies of marriage, including the choices which individuals make on whether or not to marry and on whom to marry, lie outside the control of the state. Courts as upholders of constitutional freedoms must safeguard these freedoms." Justice Chandrachud also rapped the High Court for its observations that Hadiya "is weak and vulnerable, capable of being exploited in many ways", asserting that she is a major and is entitled to "lead her life exactly as she pleases". He, therefore, agreed with the opinion authored by CJI Misra and set aside the impugned judgment, while allowing continuation of the NIA probe.